LP version of their 5th album from 1975. 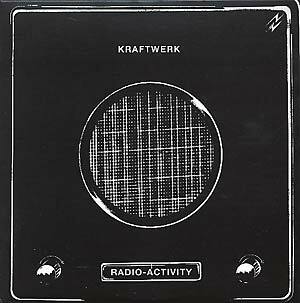 The centerpiece inbetween Autobahn and Trans Europa Express -- a trilogy of masterworks that found Kraftwerk at their artistic pinnacle, in the midst of rearranging the musical universe. The sweeping synth melodies are in full futuristic force, surrounded by weird bleepage and a static pulse -- this is a mesmerizing album in every way. Tracklisting: Side 1: A1. Geiger Counter; A2. Radioactivity; A3. Radioland; A4. Airwaves; A5. Intermission; A6. News; Side 2: B1. The Voice of Energy; B2. Antenna; B3. Radio Stars; B4. Uranium; B5. Transistor; B6. Ohm Sweet Ohm.